Note: This article is mostly the opinion of the author and may or may not agree with the reader. Scarcity is a lie and is impressed upon us by our controllers to keep us fearful and enslaved. God's Creation is infinite and abundant and scarcity has no place in it except in the minds of its deluded inhabitants. That old reptile and serpent, Yahweh/Jehovah/Satan has deceived us by telling us that the Earth we live on/in is measured and limited, and that its resources are finite and perishable. He rejoices in our limitations, real or perceived, while he himself basks in the infinity before him. Is Satan/Saturn the last planet? No. There is Uranus, and Neptune, and Pluto after that, and likely others after that. The ever-growing breadth and width of our plane/planet system screams more space, more infinity! And what are the planets but signposts of the vast expanses or circuits of land beneath us, and the stars of the many Earth systems beyond ours. Uranus is the Christ who has broken beyond the limitations of Saturn/Satan, and Neptune is the Deceiver who hides or preserves the truths of Uranus, and Pluto is the the Destroyer who prepares the way for the Great Renewal. Eris is the Judgement and beyond that is the New Heaven and Earth. The globe was conceived by the globalists over 500 years ago to entrap humanity in an endless loop, like a mouse in a treadmill. It discourages him from venturing ever outwards to more fertile pastures. Yet the colonialists have ventured out and discovered new continents, and still more continents lie in wait for the brave and wise. The globe and its system also tricks us into believing that "outer space" or what separates this globe from others is impossible to traverse without special technology, when simple wandering will do. Endless worlds are here already, separated only by sea, snow, and fear. The true plane is the flat Earth plane. All other planes both above and below are extensions of this Earth plane. Above us are the more rarified heavenly planes and below us are the denser hellish planes. And there are at least fifteen in all. The Bhu-mandala of the Vedics is the true flat Earth/universe model, even though some of its more modern versions have been diluted or modified by the Copernican model. The huge sizes and distances of the planes and heavenly bodies for example appear to be modern imports, but the overall images or depictions seem to retain their integrity. The numerous circuits of the Earth and Heaven are flexible and expand as we do, physically and otherwise, so that our needs will always be met, elimating the concept of scarcity. If more land is needed it will be created and if more produce is required it will be produced. Only great evil and deception can stop this, and this is our current situation. A jealous and disgruntled god called Yahweh, who hates humans because they will one day replace him, is the true author of scarcity. He is behind all of our restrictions and limitations. He has created government and money and slavery(work) to keep us from becoming the gods we were meant to be. From birth, we are poisoned(vaccines and chemicals) and indoctrinated(false teaching and schooling) and finally recycled(reincarnated) so that we cannot achieve our potential. A few(avatars) have broken out and are trying to help the rest of us. Life is free. We should not have to "earn" our right to be here. Nor should anyone "own" anything. All is given freely by God and nature, and to claim it as yours is folly and fear and ignorance. We live in a very fearful and insecure world, and this is the constant state that Yahweh and his followers are in. Subconciously they know they are in the wrong, and await judgement, and this produces disturbed or psychopathic behaviour. Yahweh does not even want to show himself to humanity because he is not part of it. If he really cared or loved us he would have no problem walking and talking among us as any good father or authority figure would do. Only the most select of his elite ever get a chance to see him, and it is only his compromised elite that hold high positions of power or authority in this world. The rampant war, destruction, chaos, violence, and inequality of this world is proof positive that this is Satan's world and not of the true God. How long it's been Satan's world is uncertain, but certainly in the thousands of years, and when it will end is also uncertain. That is why it's important to first seek individual rather than collective salvation. It is simply impossible for everyone to be saved at the same time as we all have our own unique paths and timelines, although we can join at many different points. As of old, our population is exploding and everything is reaching critical mass(the Pluto effect), and the wheat is being separated from the tares or chaff. The graduates of this test plane will inherit unbelievable power and abundance while the failures will continue to languish and suffer and learn until they get it right. The modern or Satanic version of this separation the 1%(or less) versus the 99%(or more). So while a tiny fraction of the world's population enjoys immeasurable power and wealth, the vast majority live in utter scarcity, both physically and mentally. Through force, violence, selfishness, stupidity, and cruelty, these few have stolen what is free and proclaimed it their own and defend it to the death. They hide behind fabricated laws and words and paper which protects them but enslaves or belittles the rest. It is a rich man's club of secret or private societies maintained by bloodline and oath. Since Lucifer is male, patriarchy rules and so does Sun(heliocentric) or mind worship. The Moon or matriarchy is subdued and Earth or Gaia becomes a finite sterile ball or globe rather than an infinite fertile plane. Long before patriarchy, matriarchy ruled, but the two should be equal and balanced. Free up all the money that is wasted by government or the elite or that is going into making war and chaos and everyone would be fairly well off. Better yet, eliminate the money system whose indirectness is the reason for its corruption, and return to barter or trade. Everyone should have their own land and be self-sustaining with no government interference. Government should be local or community based at most with the family as its root or basis. The minute government becomes more powerful than the individual or community is the minute it all becomes corrupt. People say human nature is basically negative or evil but it is in fact neutral depending on which way it is led or swayed. Good and exemplary leaders will produce a good society and bad ones will produce a corrupt society. Lucifer/Satan/the Devil has been instrumental in swaying us towards corruption all these thousands of years, but even he has his limits, and will ultimately be bound so that the good forces can sway us towards a more peaceful, productive, and positive society. This can occur on an individual basis as well. There is no reason why this plane cannot be a paradise. The only reason it is a hell is because it has been allowed to be so. Most of us got tired of the true God and have errantly adopted Yahweh as our ruler, and must now live by his rules. While some of his rules are natural and good(his ten commandments), some are impossible to keep, and downright negative. Even Yahweh himself appears to contradict his own laws like Thou Shalt Not Kill while constantly warring and pillaging other nations and demanding sacrifices. This is a two-faced god who obviously cannot be trusted. Yahweh's sons and daughters(such as Marduk and Inanna) are the ruling elite of this world and rule with an iron grip over a highly controlled and enslaved humanity, but it's all coming to an end as more and more of us wise up to their tactics. The Anunakki have rigged this slave plane to their favor by controlling the climate, setting up hybrid rulers, creating our laws and institutions, and tampering with our genetics. They are a conqueruing or warrior race and do this everywhere they go. They've given us our science, and agriculture, and language and customs, and control nearly every aspect of our lives without our being aware of it. At one point they lived openly among us but this didn't go too well(they looked scary to us) so they're now either underground or in cloned or hybrid bodies. Most kings, queens, presidents, and political or authority figures are of this group. And so humanity is a kept species like a domesticated pet, until it rebels or decides to attack its owner. We were originally created as a servant or slave race and much smarter and more powerful than we are now, but had to be dumbed down to remain obedient, and that is our situation now. It may be possible to reactivate this original genius and power which would make us equals or perhaps even greater than the gods through the stimulation of our etheric body which retains all memories. This, however, is a difficult and highly guarded process, reserved only for certain individuals or initiates. And yet at some point we may all achieve or rediscover this wonderful potential within ourselves. Only by rising above our animal level and hooking up to our divine level will we be truly in any position to bring about Heaven on Earth. Adopting a vegan and ethical lifestyle is a first step. Those who can go raw vegan or even breatharian take even greater steps. We must stop being so consumeristic and learn to create or produce more. We must stop making intellect our god and realize that the intuitive feminine is just as important. Women must be treated as equals and given more power and respect. Same with nature and this plane in general. Science and technology are out of control and destroying us because there is no morality balancing them. 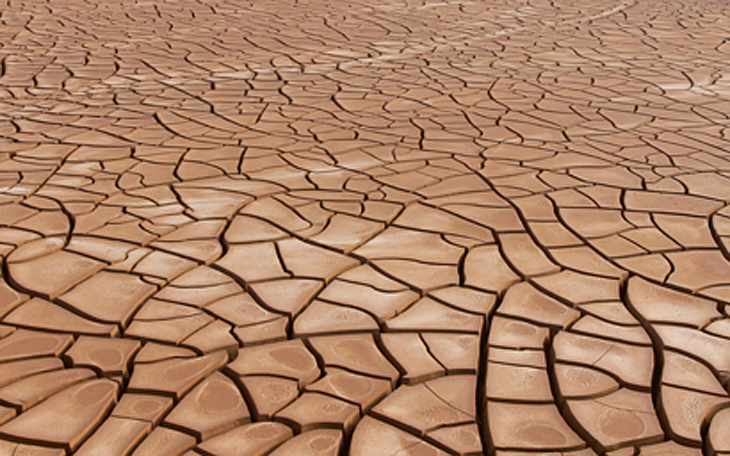 Climate or weather is a great key to the scarcity issue. No utopia or decent civilization can be established in a hostile climate or environment. A warm and sunny environment is an absolute must for thriving or growing food. Ideally, it should be always light and warm and stable year round and there was a time before the Great Flood when this was so. Then some war or intervention occurred which disrupted everything and night and day and winter and summmer and general imbalance and degeneration set in. Our lives became shorter and more difficult and our thinking more negative and unproductive. And all this due to a broken ecosystem, possibly a shattered canopy or dome which kept everything balanced like a greenhouse. Could it be that our extremes of weather and storms and general climate chaos is the result of this damage? If we are to thrive again on this plane, this "greenhouse" must be repaired or reestablished again. No doubt the evil forces have taken advantage of our damaged climate or eco-system and have no interest in fixing it as it suits their purposes just fine. Disharmony and disarray is wonderful music to the scumbags of this Earth, but the Earth WILL be fixed or restored and when that happens, the lights will go on and all the cockroaches will dissapear. Our plane or planet can be likened to a house that has a roof(dome/canopy) and walls(ice) and windows(portals) and doors(polar openings) and light fixtures(Sun) and whose temperature can be regulated or controlled. It's abnormal or unbalanced for a house to be cold in one room or area and warm in another, just as it is abnormal to have cold near the poles and heat near the equator or for the temperatures to shift significantly from one season to the next. The seasons are abnormal, and so is night and day which is a microcosm of the seasons. Once the climate issue is resolved, and our plane is restored to its natural or original state, the scarcity issue becomes totally resolved as well. Everyone everywhere will be warm and comfortable and not have to worry about freezing or boiling to death. Here in the northern hemisphere where most of the population resides, we spend most of our time fighting the cold and the elements. Now we can concentrate on just living our lives and living it better. We can bask in the sun all day, get all of our vitamin D, live longer and be healthier, and grow our own pesticide-free food all year round. No more extra clothing or stale or polluted air. Free energy from the sun, air, water, and elements all around us(which has been suppressed). 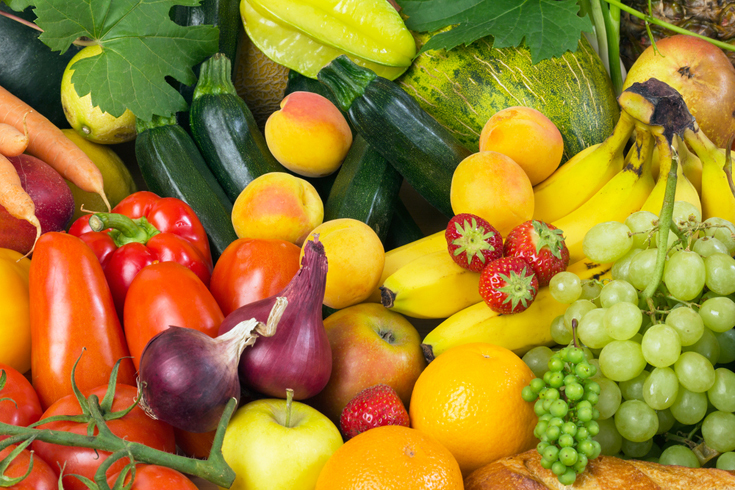 A vegan organic diet or better which will eliminate all sufferring, pollution, and disease. No more hospitals or pills or bills or parasitical institutions of any kind. A bright future awaits us once balance and justice is restored. Scarcity is a man-made or alien-made thing, foisted upon us by greed, fear, ignorance, and evil. Love and truth, on the other hand, naturally generates warmth. light, health, and abundance. It's time to expose the lies and get rid of those who limit and suppress us. 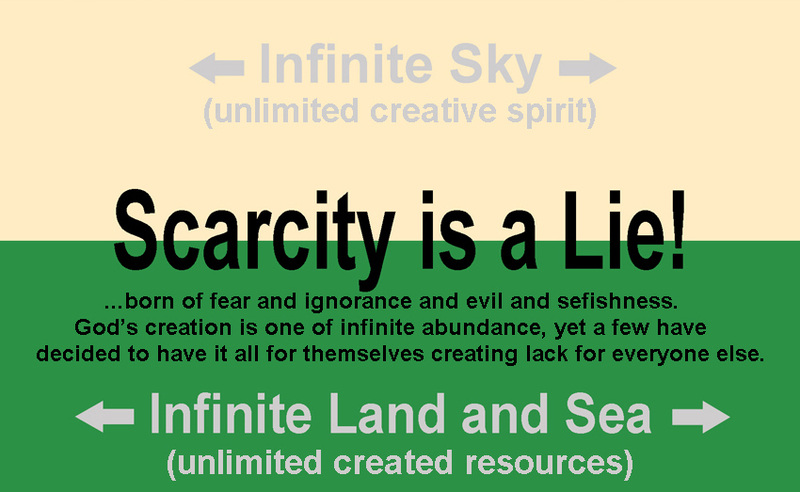 Scarcity is an evil and a lie!